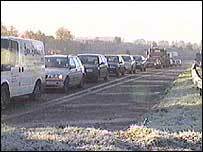 The Highways Agency has admitted underestimating the amount of traffic that would be using junction 12 of the M5 at Gloucester. Police are concerned traffic coming off the single lane northbound turnoff often backs up onto the motorway. Andrew Hewitt, Highways Agency performance manager for the South West, admits they made a mistake. "Hindsight's a wonderful thing. If we'd had that when we started, we'd have got it right," he said. Junction 12 was formerly only a northbound exit until the southbound turnoff was opened in 2002. Earlier this week, the police officer in charge of the county's motorways said he was "worried" about the junction and wanted to see it expanded. Inspector John Pickersgill said: "It has no hard shoulder to operate in or to put the static traffic on while we try to clear the roundabouts above it." Mr Hewitt said there were similar difficulties at other junctions across the country, but that the problems were being tackled. At junction 14, new traffic lights, which cost £700,000, are having to be switched off during peak hours because they are "not talking to each other" and causing severe congestion. "Yes we have a difficulty, yes we have concerns, yes we're looking at solutions," said Mr Hewitt.